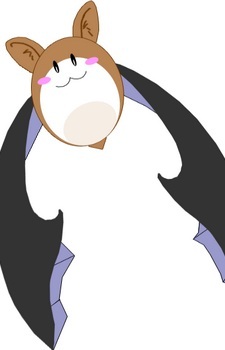 A bat who acts like a narrator saying things like how long a battle takes place and occasionally covering up fanservice. It appears in the manga's sequel, Rosario + Vampire II. He seems to be Shuzen Kokoa's servant. His special ability is to turn into any kind of melee weapon, his only draw back is he weighs 100 kg. He has a tendency for saying 'weeee!' after any commentary or plain statement.